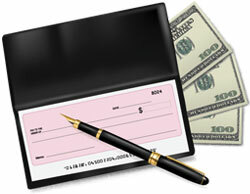 A Substitute Check is a paper reproduction of an original paper check and is permissible in accordance with the Check Clearing for the 21st Century Act (sometimes referred to as "Check 21"). The Federal Act allows for the electronic capture and electronic passage of vital information from your original check through the check processing system. It also allows for the creation of a "Substitute Check" to replace the original check at any point in the process if needed (if for instance a financial institution in the process is not capable of accepting the electronic image). These checks are similar in size to standard business checks with a slightly reduced image of the front and back of the original check. The front of a substitute check must state: "This is a legal copy of your check. You can use it the same way you would use the original check". A MICR (Magnetic Ink Character Recognition) line containing all the information on the MICR line of the original check makes it suitable for automated processing in the same way as the original. Because a Substitute check is the legal equivalent of the original you may use a copy of a cleared substitute check as proof of payment just as you would a copy of a cleared original check. What Are Your Rights Regarding Substitute Checks? If you receive a substitute check the federal law provides you additional rights. These rights do not apply to original checks or to electronic debits to your account. However, your rights under other law with respect to those transactions are not impacted. These additional rights allow you to request a refund for losses you suffer if the substitute check you received: does not meet the legal equivalence of the original check, if payment was made twice on this same item, or if you suffered a loss due to the receipt of a substitute check. (You may receive a Substitute check if a check you deposit with us is subsequently converted to a substitute check and is then returned to DCU unpaid due to insufficient funds, uncollected funds, etc.). The losses you may attempt to recover under this procedure may include the amount that was withdrawn from your account and fees that were charged as a result of the withdrawal (for example, bounced check fees). The amount of your refund under this procedure is limited to the amount of your loss or the amount of the substitute check, whichever is less. You are also entitled to interest on the amount of your refund if your account is an interest-bearing account. If your loss exceeds the amount of the substitute check, you may be able to recover additional amounts under other law. If you use this procedure, you may receive up to $2,500 of your refund (plus interest if your account earns interest) within ten (10) business days after we received your claim, and the remainder of your refund (plus interest if your account earns interest) not later than forty-five (45) calendar days after we received your claim. We may reverse the refund (including any interest on the refund) if we later are able to demonstrate that the substitute check was correctly posted to your account. How Do I Make a Claim for a Refund? A copy of the Substitute Check and/or the following information to help us identify the Substitute Check: (identifying information, for example the check number, the name of the person to whom you wrote the check, the amount of the check). If you have questions about a particular item or to make a claim contact us Monday through Friday 8:00 a.m. to 9:00 p.m. or Saturday 9:00 a.m. to 3:00 p.m. ET. Or, you may complete and fax the Substitute Check Claim Form.